Many companies have implemented an S&OP process and continuously improved to aim for the highest level of S&OP maturity and create business value. Although there are plenty of S&OP maturity models around to assess how a business is performing, there is unfortunately no agreed world standard. Individuals have a positive and growth mindset, show effective behaviours and emotional intelligence towards others. People are rewarded for good behaviours. Effective and sustainable S&OP requires good decision making, pro-actively work across silo’s, constructive conflict resolution amongst many other effective behaviours. In his book ‘Learned Optimism‘ Martin Seligman, a leading psychologist, shows that positivity outperforms negativity. And research from Human Synergistics shows that company cultures with effective behaviours outperform the least effective organizations on inter-unit coordination with 26%. 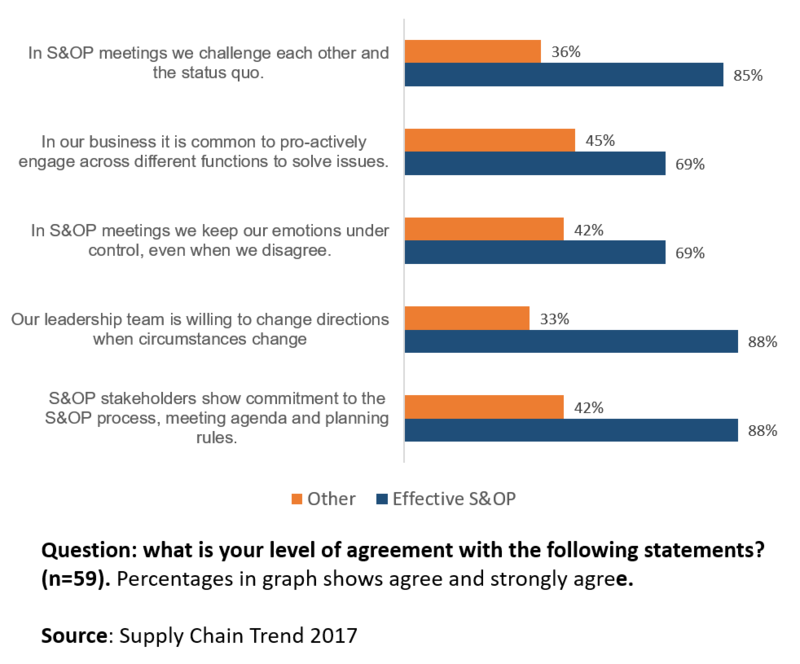 The results from my S&OP pulse check 2017 indicate that there is a relation between effective S&OP and attributes of Mental Toughness, trust, teamwork, constructive behaviours and understanding of company goals. It is understood by the business that a positive mindset is a must and behaviour is a competence and there is action to include behavioural competence in reward & recognition, recruitment and learning & development policies. As Collins and Porras say in Build to Last; “Imbedded company behaviours will drive a sustainable company culture, which will last over time”. If you want S&OP to last over time, behavioural competence needs to be build. It requires a lot of extra focus, dedication, coaching and hard work on top of S&OP change. Niels van Hove is a Supply Chain consultant and S&OP expert. He is founding coach at MentalToughness.online. He is passionate about helping individuals and organizations be themselves at their best.